At Mount Hermon Adventures we get to serve guests with a variety of needs. The nature of our activities means that very often we’re helping people conquer a fear of heights, to trust in themselves and their friends, or providing a once-in-a-lifetime experience. All of our work is important but there is nothing we love more than being able to make adventure happen for folks who weren’t expecting it. This month we bring you a staff story of one such guest named Sean. Sean has Cerebral Palsy which means he struggles with balance and uses a wheelchair. He has been denied the opportunity to try many things, such as zip lining. Most of the time Sean’s mother stayed with Sean on the ground and let her husband have the adventure. This time Sean was going to have an adventure and so were his mother and father. It was our pleasure to take the family out on the Redwood Canopy Tour and allow them to experience the coast redwood trees from well over 100ft. up. Sean loved the freedom the zip lines gave him, the rush of going fast, the wind pushing against his face, and the feeling of soaring through the trees. It was beautiful to hear the laughter of our group echoing down to the meandering creek while taking in the unique perspective on the world begin 140ft up a tree offers. It was amazing to watch Sean’s parents absorb the delight in his face. Sean’s mother was nervous of heights, so while her son was learning to relax and let the harness support him, she was working through her own battle. Such fears have turned more than one guest back before, however, that was not the case today. Sean was able to see his mother work through her own challenge by not letting her emotions overwhelm her, but instead by learning to trust in something unfamiliar. Having the opportunity to talk and have a great time with the Sean and his family was an incredible experience. They all were very lively and witty which I greatly admire. We had wonderfully nostalgic conversations about Disneyland, as well as sharing and discussing our splendid Coast Redwoods which is a personal favorite topic of mine. During our adventure Sean informed us that we were the first location to take them out on a tour, which brought me pride in serving and being able to provide them this experience as well as in Mount Hermon for accommodating their needs. Serving Sean was an enriching and fulfilling experience that I am glad I was able to be a part of. A personal goal of mine is to enable others in any capacity to challenge themselves as well as exposing individuals to nature and the outdoors, which made this an extremely fulfilling experience. Need to get away, laugh and feel the rush and freedom of soaring through the trees. We’re here for you. 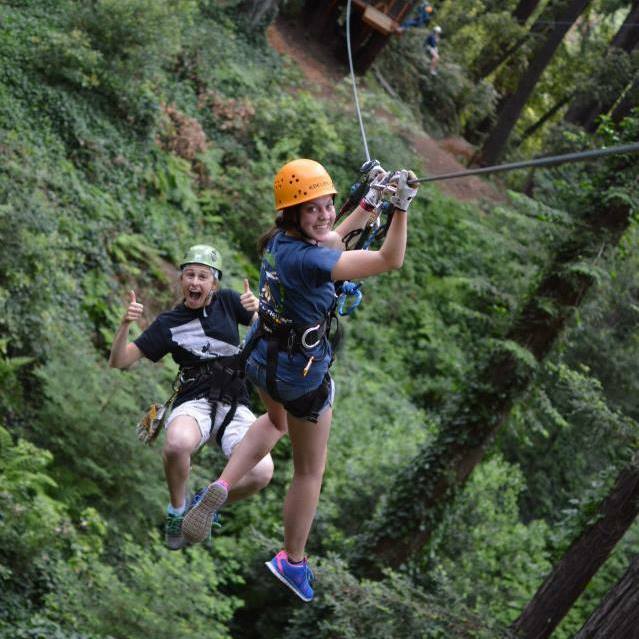 What is Mount Hermon Adventures?